Why I don't embrace a dedicated work environment - Work ... Uncaged. Many of them offer similar advice and much of it good. There is one commonly offered suggestion, which I do not subscribe to: have a dedicated workspace ideally with a door. My biggest issue with that is my house. I have a very open floor plan. From where I’m typing this I can see into my bedroom, the family room, the living room and a good portion of the kitchen. Until my daughter moved out, there was no isolated workspace available for me. So perhaps it is because of this, that I’ve not embraced the idea of a dedicated workspace. I might be rationalizing, but I have some other suggestions, which accomplish the same thing for me. First off, one of the key reasons for the dedicated workspace is to allow a clean delineation between “home” and “work”. I do believe that getting away from work is important. I know from experience that it is very easy to simply keep working or “quick check something”. In the open floor plan I described, I can always see my desk. The lure of a quick email check took me a while to overcome. Adding to that, I do enjoy working on my personal projects on the computer. That puts me even closer to work related things. In the beginning that often led to a lot of extra work. I’m pretty sure I was a solid statistic in research like Remote Workers Log More Hours and Are Slightly More Engaged. I’ve made a few adjustments to overcome this. The first of which was giving up on an email client. I don’t have anything per se against email clients, but it’s very easy to have all your email show up there. It’s convenient and also easy to get sucked into work email. My personal email is on Google and my employer also uses Google apps. I replaced the email client with Google Inbox. In order to read my work email I have to open up the browser and point to the work inbox. That’s an extra step, which doesn’t seem like much, but it is far less likely for me to stumble into an email. I also turn off all email notifications and only drink from the email well a couple of times a day. For project tracking we use a specific tool. It’s one I don’t use for personal things. If that tool is not open I won’t fall into the “task hole” and get stuck. The same goes for many other sites and tools. For some very specific work items I’ve created an extra user in Chrome. I use that user with its own window to do those work things. That keeps my history from getting cluttered with work related links I might be tempted to open. I do the same for Slack, which we use for messaging. I think you get the idea. It also extends in the other direction and keeps me from getting distracted with personal things while I’m working. When it comes time to quit for the day, I simply close the work related windows and tabs. In a sense, the result is a dedicated work environment. Unlike a dedicated physical office this is simply a virtual workspace. It’s also possible to have different computers. At one point I experimented with different laptops. That was too tedious for me. Since I own my work laptop I simply opted to split the use “virtually”. I have another reason for not wanting to have an isolated and dedicated workspace. I worked too hard to get out of the confines of an office only to chain myself to one at home. That might sound a bit dramatic, but hear me out. There were many things I disliked about working in an office. The commute, the interruptions, crazy things dealing with a shared kitchen, and being tied to that spot someone told me to sit at. I like to move around. I don’t do it all the time, but it’s not unusual to go sit on the porch for a half hour and then spend some time in the dining room. Sometimes standing at the breakfast counter is what I’m in the mood for or even lounging on the couch. Most of the time I’m at my desk, but I enjoy the freedom of changing the scenery. That might even include leaving the house for a coffee shop, the library, etc. I do understand the concern with interruptions. It sure happens in my house. That’s why I have headphones. Everyone knows that when I’m wearing them, I’m working. It has the same effect as closing the door to an office. The biggest difference is that I can take my headphones and sit in a different part of the house. 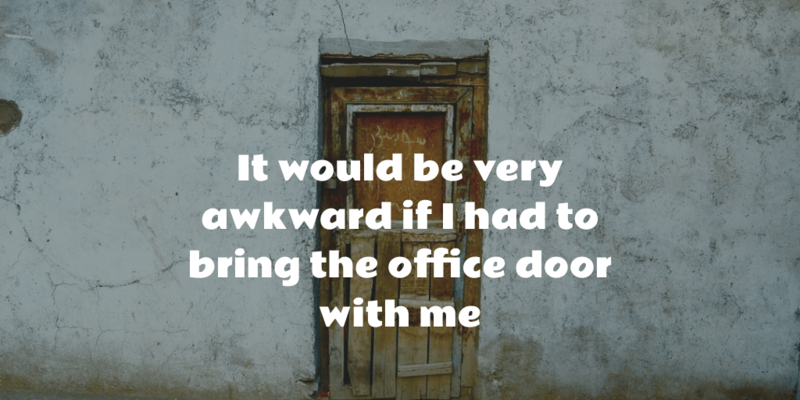 It would be very awkward if I had to bring the office door with me. My final reason for choosing a virtual work environment is future looking. My wife and I are working toward a nomadic lifestyle. We’re not there yet, but at some point we will pick up to work from another continent for a month. When that happens, I don’t want to worry about needing an office. So I’m cutting my teeth on working from anywhere while I have a lot of control over my environment. I’m sure the dedicated office works great for a lot of people. I have friends who have taken that approach. Perhaps it’s a great way to get started with working from home. For myself, I prefer to separate work from personal in a virtual fashion and working from where my mood takes me. I think of it as working uncaged. Designed By InkHive. © 2019 Work ... Uncaged.. All Rights Reserved.